The Dragons and teams from Girlguiding Broken Cross District, SUSO, The Rossendale Trust, East Cheshire Eye Society and ROAR. 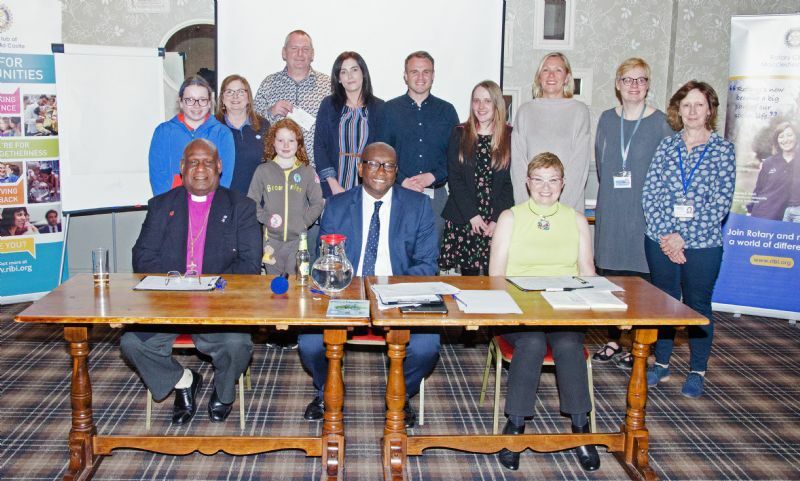 The Rotary Club of Macclesfield Castle invited 3 Dragons to hear presentations from each of five local charities which had been finally selected from 18 initial invitees. Ms. S Lock retired Director of Strategy for Older People at The Guinness Partnership and CEO of Wolvern Housing. In a Dragons Den-style pitch event held at The Legh Arms, Adlington, each group had just 5 minutes to pitch for funds up to £800. Each of the 5 local charities proposed a project which would have a direct impact on the local community and for which they were seeking funding from the local Rotary Clubs Charity Fund. After hearing the presentations, the Dragons carefully deliberated on the award of money to each of the projects. Reach Out and Recover were awarded funding towards a project to help school children understand the issues around addiction. East Cheshire Eye Society were awarded funding towards a project helping the visually impaired becoming more self-reliant through the use of nature and art.The Rossendale Trust were awarded funding towards expanding their cookery project for adults with learning difficulties.Speaking Up Speaking Out were awarded funding towards setting up a cafe where adults with learning ability issues can gain work experience. Girlguiding, Broken Cross District, whose team included girl guides Amelia and Isabelle, were awarded funding towards new equipment and materials to help them meet the requirements of the new Guiding Curricular. Rotary Club President Carole Murphy was delighted at the success of this new event which was organized by Chris Watson and the Community Service Committee: The local Rotary Club organize many events during the year to raise funding. We receive wonderful support from local people at these events, including at the Christmas collections and the annual Swimathon. We are always keen to use some of this money to support local charities towards achieving their projects and this year decided to hold a Dragons Den event as part of our support for the local community. Dragon Chairperson Emmanuel Botwe, Headteacher at Tytherington School said: I was delighted to have been invited by the Rotary Club of Macclesfield Castle to take part in this wonderful community event. The presentations were first rate and the presenters did their charities proud. It was difficult to choose between such worthy causes. The Rotary Club does such tremendous work within the local community and Im honoured to be associated with them.